We recently travelled to Riga, Latvia, for a week. Ou plan was to split the week and spend time in Riga and Tallinn, Estonia. I did my research and knew Tallinn’s Old Town was beautifully medieval, but I did not quite expect it to be as stunning as we discovered. 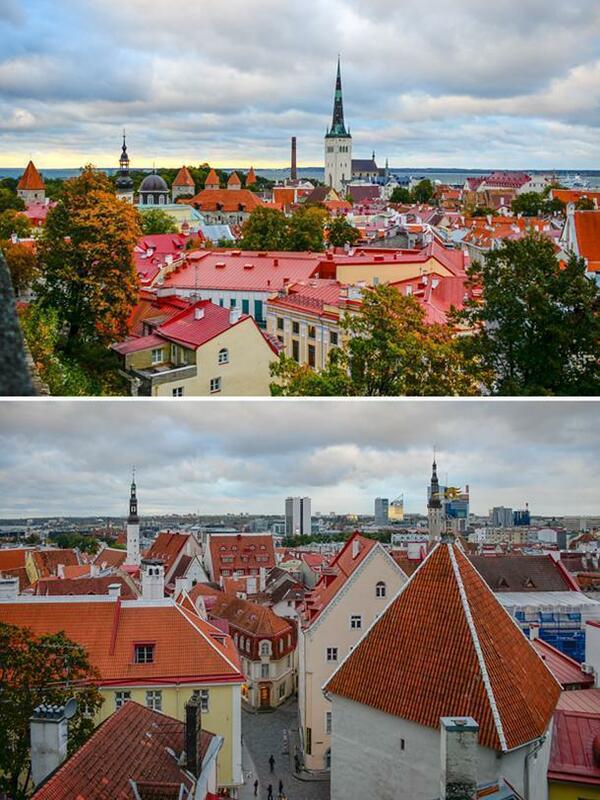 Tallinn’s Old Town is one of the best preserved medieval cities in Europe, and it is a UNESCO World Heritage Site. 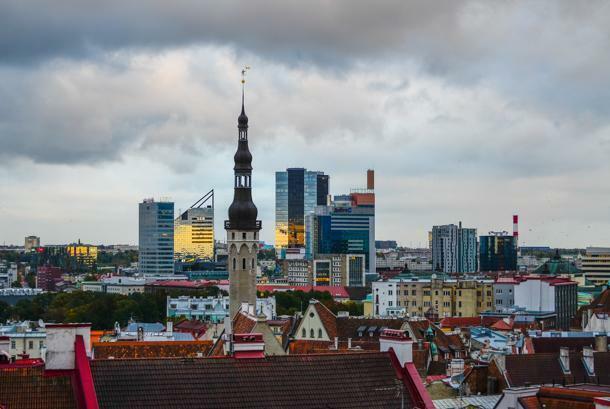 Greater Tallinn is known as the Silicon Valley of Estonia. With the highest number of startups per person in Europe, Tallinn is among the top 10 digital cities in the world. I hope my introduction piqued your interest in Tallinn as it is only getting better from here. 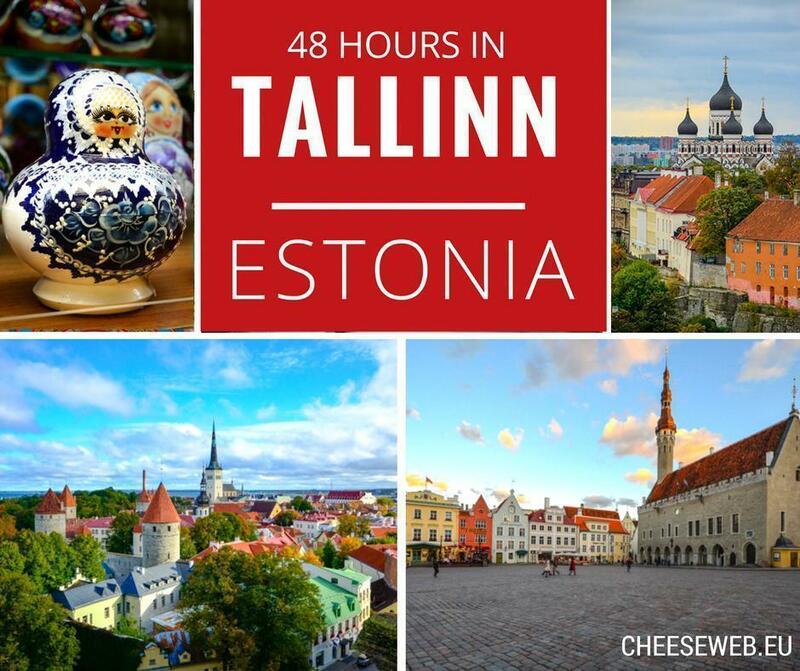 There are several ways to get to Tallinn from Riga. Flying is a good option. However, we did not want to add more expenses to the plane ticket, such as taxi fare to and from the airport, which is 20-25 euro one way. You can rent a car, but it’s not affordable as you also have to buy insurance. In the end, we chose the best option for us – to travel by bus. There is an excellent company called Lux Express that services Northern, Eastern, and parts of Central Europe, as well as Russia. I was impressed by the prices and level of comfort they offered. On our 4 hour ride, we enjoyed movies in English, free wi-fi, free hot drinks, ample leg room, and convenient electric outlets at every seat. The round trip for our family of 4 cost us a little over 100 euros. 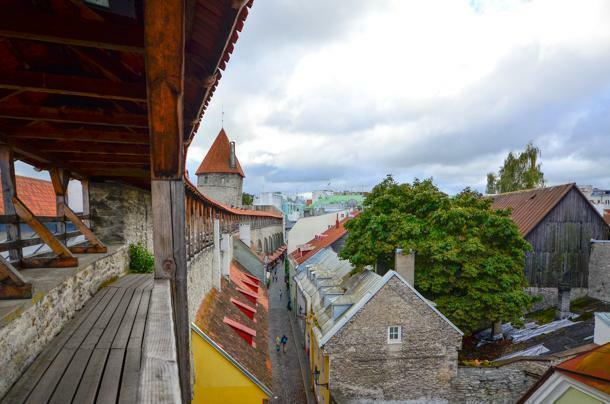 While searching for a place to stay, I discovered Tallinn is nearly as affordable as Riga. 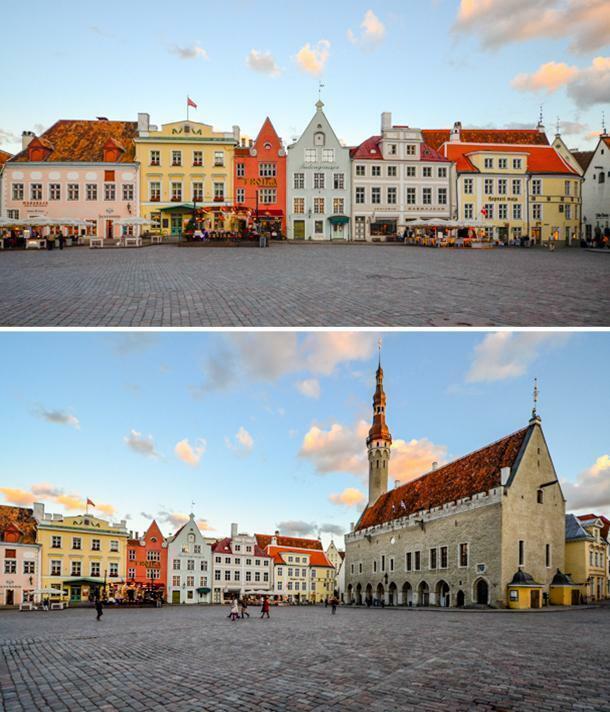 We allocate a small budget for lodging when we travel, and Tallinn fit right in that budget. We rented Julika’s studio apartment via Airbnb as the location was convenient for visiting the Old Town. 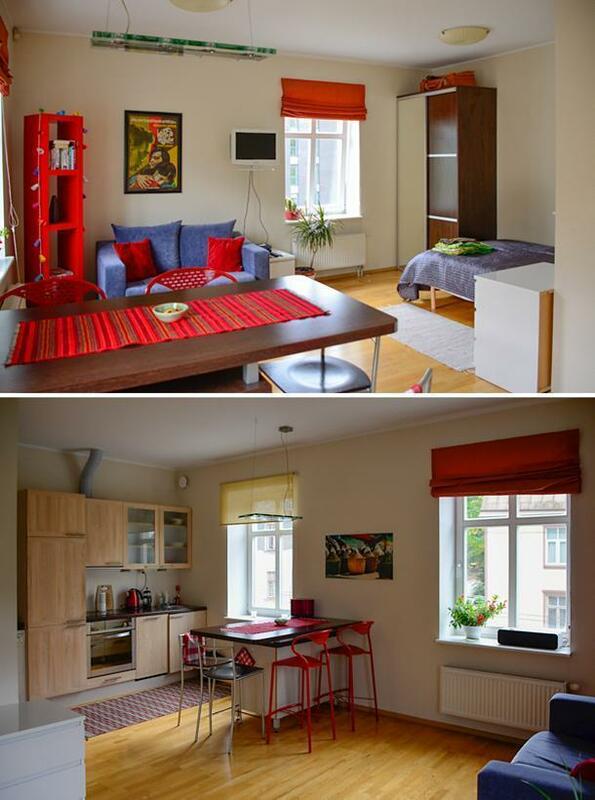 The apartment is close to a little grocery store, a restaurant, and is only a 10-15 minute walk from the Old Town. 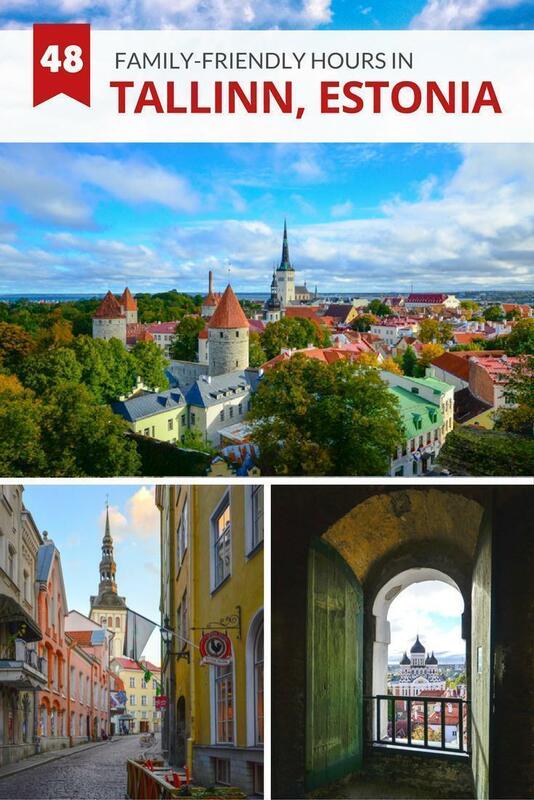 We enjoyed discovering Tallinn’s Old Town on foot. Everything is in walking distance and wandering the narrow little streets was pure pleasure. 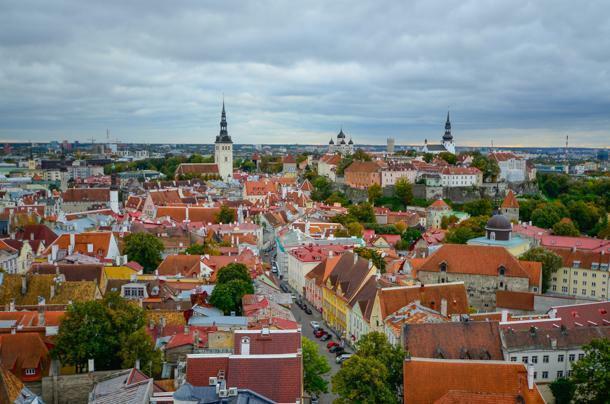 Toompea Hill is at Tallinn’s highest point, giving you some spectacular views from the two platforms dedicated to viewing. 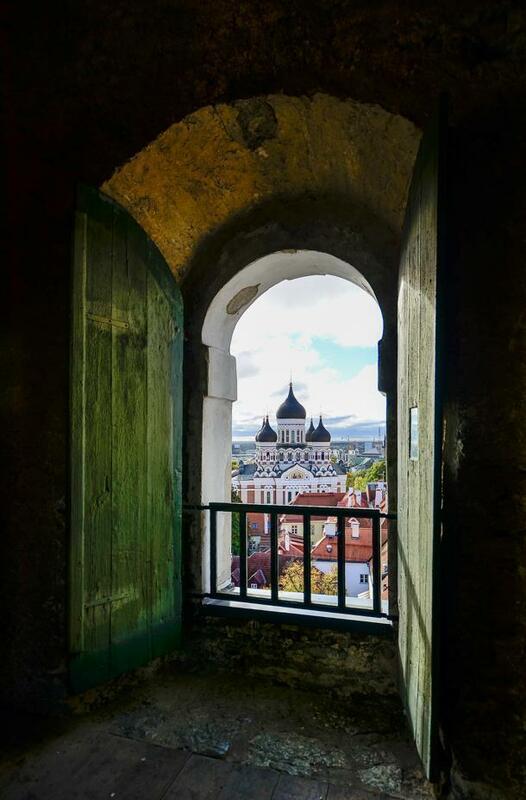 Toompea was once a heavily fortified separate town and has always been the seat of Estonia’s ruling power. 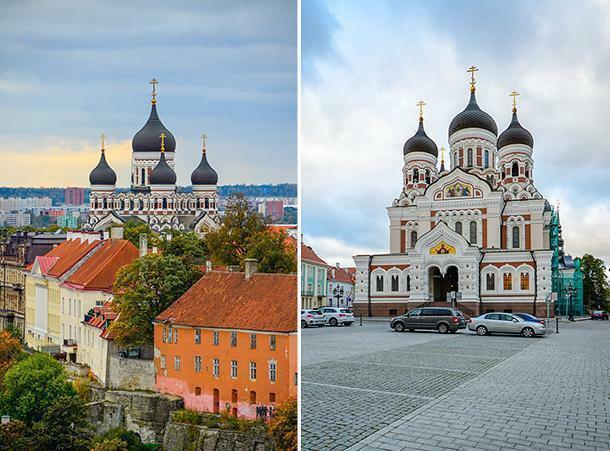 The major attractions are the medieval Toompea Castle (today housing the Estonian Parliament), the Russian Orthodox Alexander Nevsky Cathedral, and St. Mary’s Cathedral. 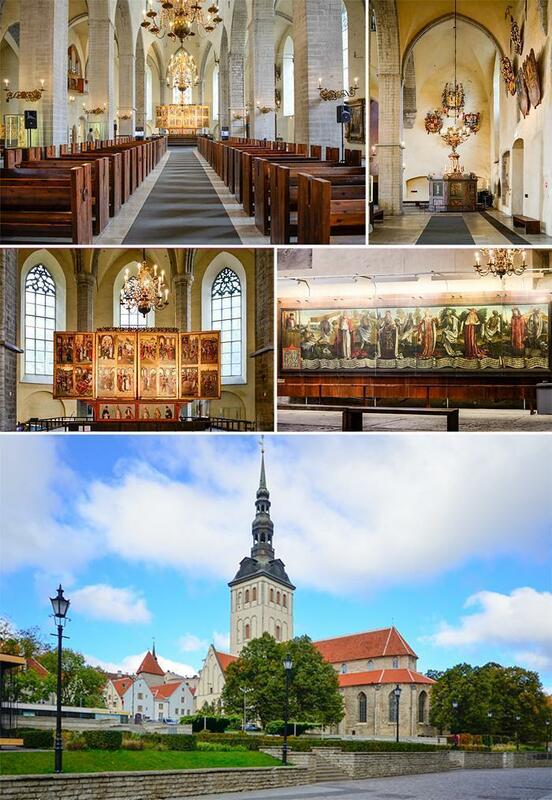 The 13th century St. Mary’s Cathedral is the oldest church in Tallinn and mainland Estonia and is the only building on Toompea Hill that survived a 17th-century fire. The interior walls are beautifully decorated with coats of arms dating the 17th-20th century. 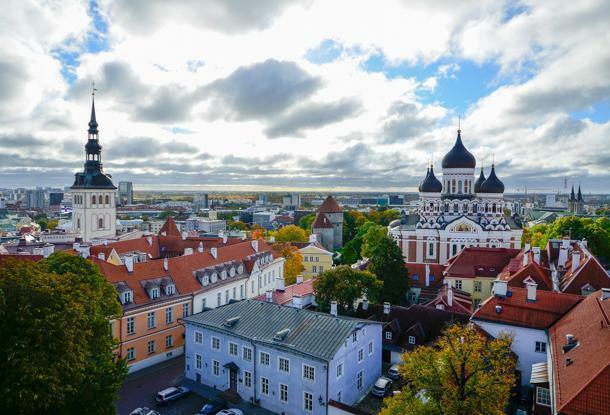 There is a small fee to visit the church and it includes the 69m tall tower, which offers spectacular views over Tallinn. Alexander Nevsky Cathedral was built while Estonia was part of the Russian Empire and is Tallinn’s largest Orthodox cupola cathedral. The cathedral crowns the hill of Toompea beautifully, although many Estonians see it as a symbol of Russian oppression. It was even scheduled for demolition but due to lack of funds the decision was never acted on. Descending from Toompea Hill, you’re greeted by the impressive St. Nicholas Church dedicated to the saint of sailors and fishermen. One major reason to visit this church is the artwork. St. Nicola’s is part art museum, and one of the most famous pieces of art is Danse Macabre, or the Dance of Death, by the Lübeck master Bernt Notke. The skeletal figures of Death dance with the rich as well as the poor, the mighty as well as the feeble. Only a fragment of the 30m long painting survived a bombing raid in 1942. Another important piece is the High Altar, depicting the life of St. Nicholas, made in the workshop of Hermen Rode, another master painter from Lübeck. 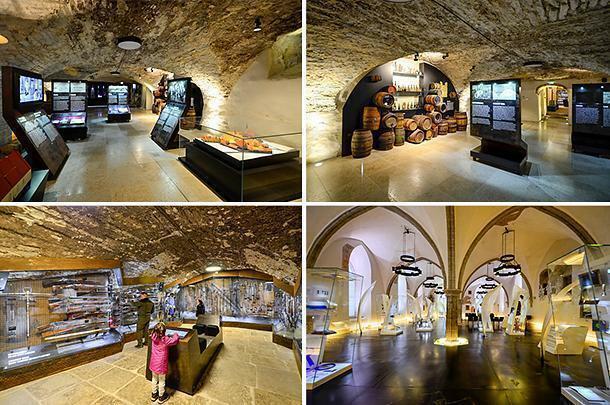 1.9km of the original city wall and 20 defensive towers wall are still standing making Tallinn one of Europe’s best preserved medieval fortifications. A large part of what gives the Old Town its fairytale charm is the system of walls and towers surrounding it. 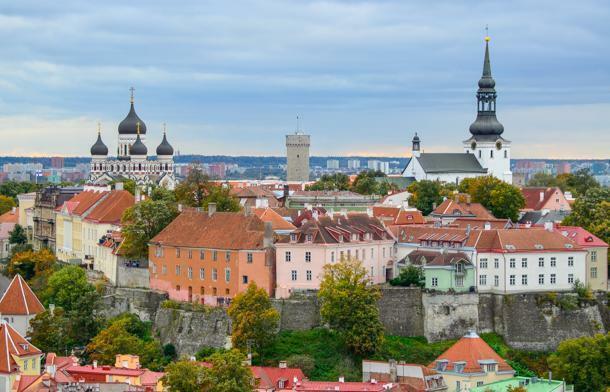 For a small fee, you can walk the portion of the medieval wall connecting the Nunna, Sauna, and Kuldjala towers and you can imagine how it was used to defend the city while you admire the Old Town’s red tiled roofs. Town Hall Square has been a marketplace and the centre of the Old Town since the Middle Ages. In the summer, it is filled with outdoor cafés. It hosts the Old Town Days and other medieval festivals and is a venue for open air concerts and fairs. In the winter, the square is a magical Christmas market, the centrepiece of which is a towering Christmas trees. Christmas festivities were first celebrated here in 1441 when the Brotherhood of the Blackheads are believed to have erected the world’s first Christmas tree. Visiting the Town Hall is allowed off season only by appointment. Calling was easy and, to our unbelievable luck, we were admitted right away. Once considered the tallest building in the world, St. Olaf’s Church is dedicated to King Olaf II of Norway. It is one of the main symbols of Tallinn. This church is not particularly striking on the outside, and the interior is modest as well. The reason you should visit is the 124m tower. 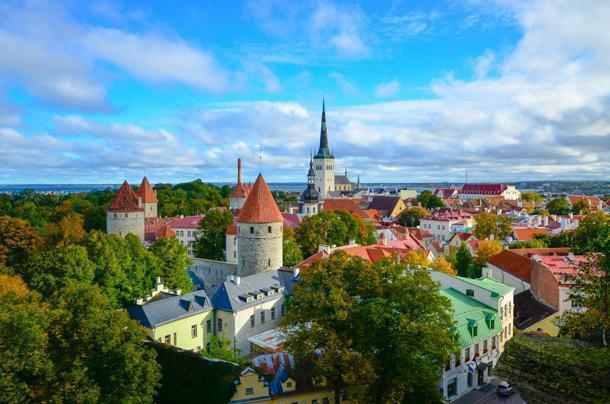 At the end of a gruelling, narrow, 232 step spiral ascent, you will be rewarded with splendid views of the city of Tallinn, Toompea Hill, as well as the port. The Great Guild was a guild for merchants and artisans, operating in Tallinn from at least the 14th-century until 1920. 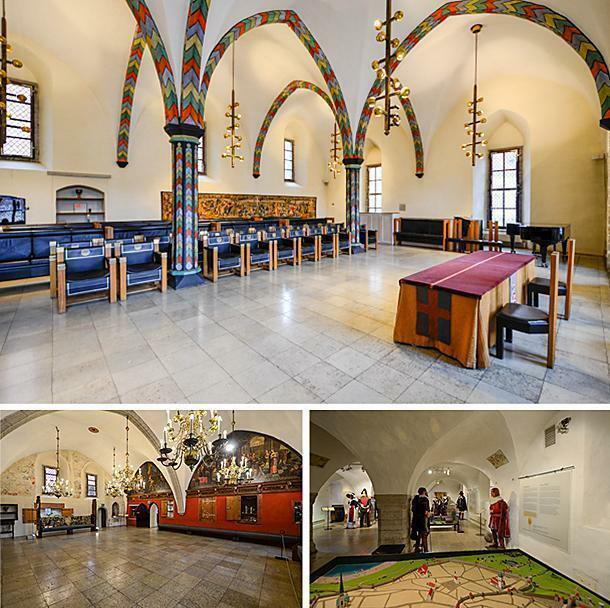 Its home was the Great Guildhall, a Gothic building in the centre of Tallinn, today housing the Estonian History Museum. We spent an enjoyable time here with our kids. The information is also in English, and the museum is modern. The exhibits are beautifully displayed and interactive. If you travel with children, it’s a great learn by play opportunity. 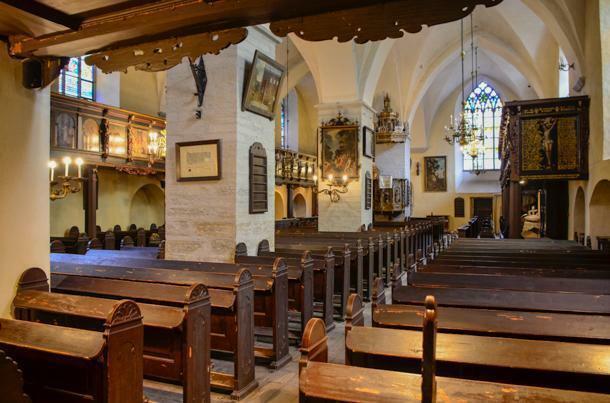 The little 13th-century Lutheran Church of the Holy Ghost, situated opposite the Great Guild, impressed me the most of all the churches in Tallinn. The large Gothic windows decorated with beautiful stained glass and the richly decorated woodwork, are quite a sight and worth the small entrance fee. Also notice the remarkable main altar, a work by Bernt Notke, dating from 1483 and depicting, the descent of the Holy Ghost on the twelve apostles at Pentecost. 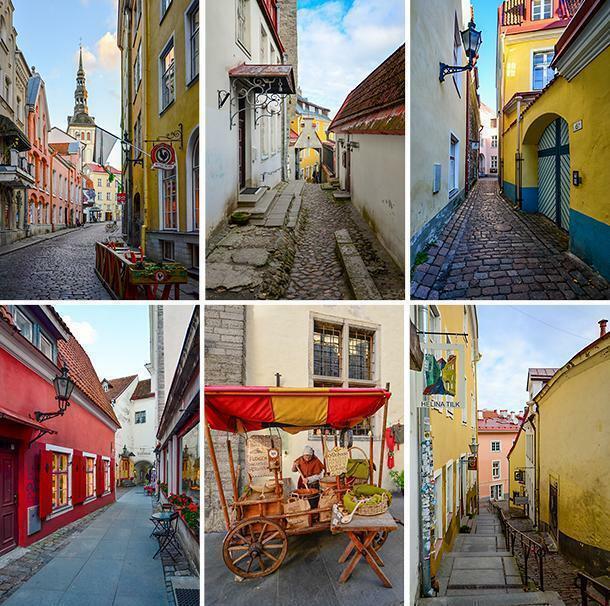 The colourful streets of Tallinn’s Old Town. Probably my favourite part of visiting Tallinn were the narrow, cobblestone streets. As a travel photographer, I love tight, colourful angles and walkways. Tallinn made me and my camera happy. My family did not always want to join in so they would stay at a café while I roamed the Old Town alone. I don’t generally get excited about shopping when travelling, but Tallinn’s shopping scene is quite different. 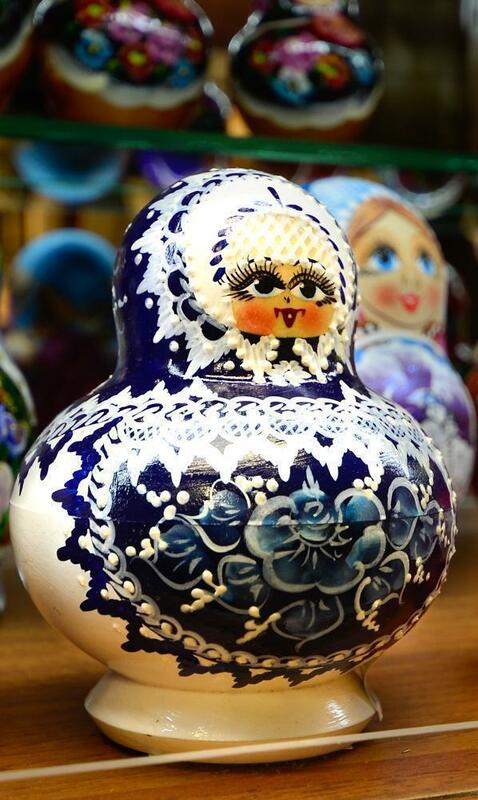 You will not find things made in China in the Old Town shops. Most of the merchandise is made in Estonia or the surrounding countries. Wool and amber products are sold in most stores. 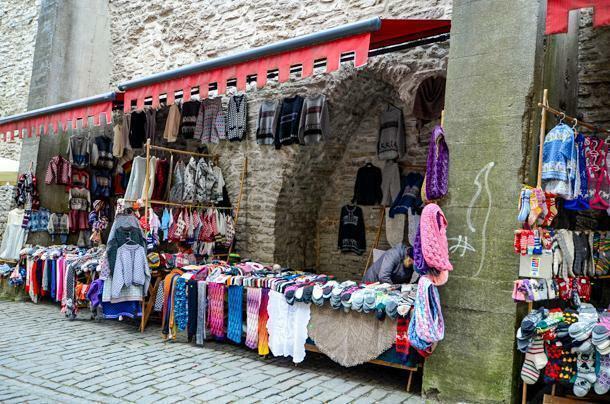 Make sure to pay a visit to the Tallinn Wool Market set up along Müürivahe Street, next to the medieval wall. The wooden stalls are open from 10 am – 7 pm, Monday through Friday. We were able to purchase beautiful Christmas sweaters and hats at affordable prices. 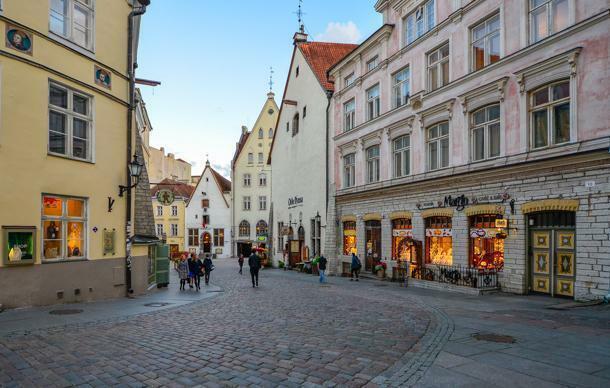 As affordable as it is to visit Tallinn, the food scene in the Old Town is the complete opposite. Because the majority of tourists in Tallinn are cruise ship visitors who spend only a few hours in town, the restaurants are not at all affordable. We mostly cooked for ourselves in the rental apartment, but we did splurge a little as well. The Beer House is the only restaurant-brewery in Estonia, which produces seven kinds of non-filtered and unpasteurized beer from 16th-century Bavarian recipes. The restaurant’s interior is decorated to resemble a row of Austrian beer houses. Photography is not allowed inside but being the rebel I am, I managed to squeeze one photo to show you this unique and quirky place that was also visited by Lenny Kravitz. The menu is meaty and hearty. Try the duck confit or the goulash in a bread bowl! If you travel with kids with finicky appetites, there is an entire pizza list. Our son ordered one not knowing just how massive it was. We ended up sharing it. 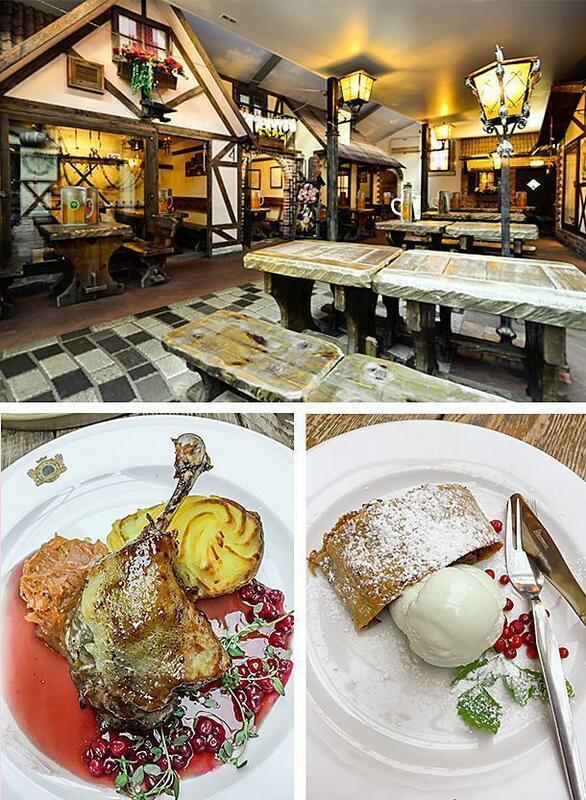 Eating at Olde Hansa is the closest thing to enjoying a medieval meal in a medieval setting. The attention to detail is quite striking. The restaurant did not leave anything out. There are performances outside the restaurant to lure people in, greeters who will tell you old stories about the town and give you medieval coins. Inside the coins can be returned for free shots of schnapps. Once inside, the setting is medieval with meals by candlelight. The menus, written in a medieval font, describe the dishes in detail, and they include game delicacies cooked using 15th-century recipes and methods. The servers are dressed in medieval garb, including long, pointy shoes, and are extremely attentive and fast. The main courses are not cheap, averaging 40-50 euro, but they are massive and elaborate. Do try the beer which, true to the period, is not bittered with hops. Make sure to try the strong, dark beer with herbs. Be prepared as it will come to the table in a massive 1L clay mug. It may not be cheap but eating at Olde Hansa is a trip in and of itself, so my advice is to go for it. 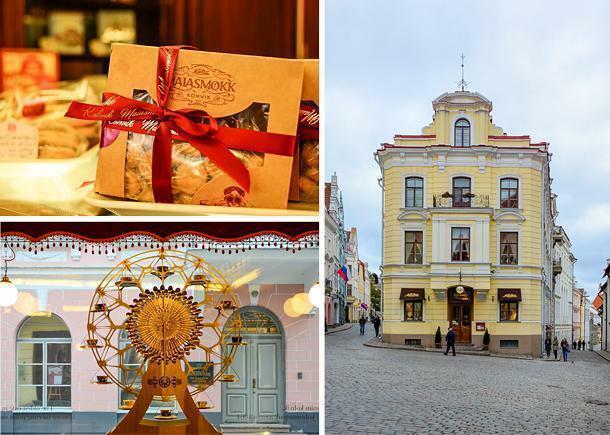 Maiasmook café is the oldest café in Tallinn, dating from 1864. Maiasmook is the perfect choice for an affordable meal and drinks. Here we enjoyed delicious cappuccinos daily. Check out the marzipan room where you can watch artisans paint marzipan figures. 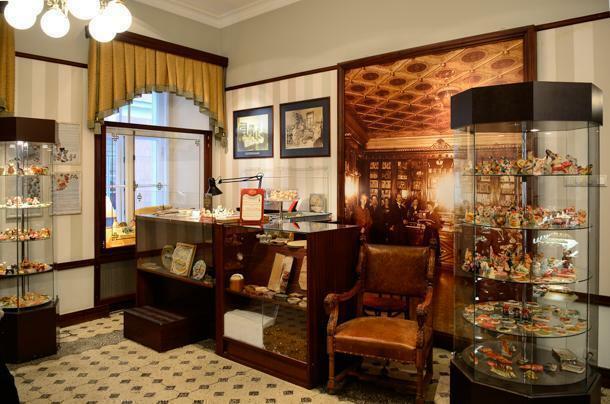 The exhibition features additional information boards in Estonian, English, German, and Finnish about the history of marzipan making in Tallinn. 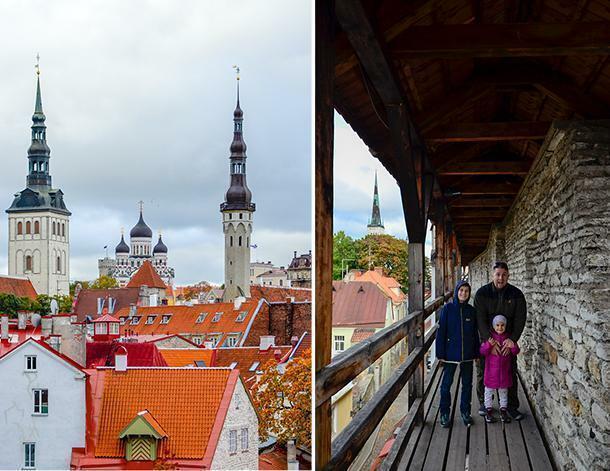 Deciding to visit Tallinn was one of our best family travel decisions. It is not as touristy as Paris or London, but it’s a destination that should be on everyone’s travel bucket lists.